Philippe Coutinho‘s second-half goal in Saturday’s 2-1 win away to Stoke City saw the Liverpool player break a long-standing Premier League record. The 24-year-old hammered home after Emre Can‘s cross was deflected to the edge of the box by Glenn Whelan, setting in motion an excellent comeback at the Britannia Stadium. Coutinho’s compatriot, Roberto Firmino, sealed the victory a minute later, as Samba gold shone through in Stoke. 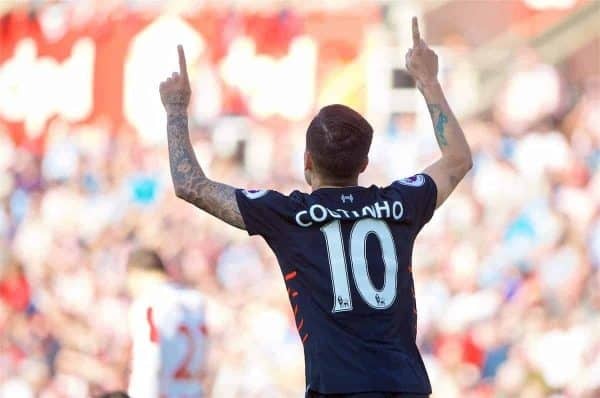 And after a performance of South American flair, Coutinho has more than three points to celebrate, as he is now a record-holder in the English top flight. Coutinho has scored 30 Premier League goals since he joined the Reds in 2013, making him the highest-scoring Brazilian in the competition’s history. Coutinho has now surpassed former Middlesbrough midfielder Juninho to take up this distinguished position. That he has done so before he reaches his peak years is particularly impressive, with Coutinho set to continue his trajectory towards the world-class bracket at Anfield. With Firmino currently fourth in the race, too, he can enjoy a friendly rivalry with his partner in crime. Firmino’s winning goal at the Britannia was of the highest quality, with his volleyed effort reminiscent of his predecessor, Luis Suarez. But the No. 11 was earmarked for a rather impressive record of his own after Saturday’s victory. 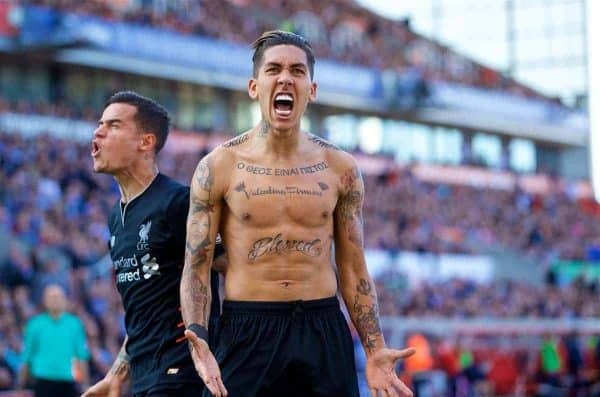 Pulling off his trademark celebration by whipping his shirt off in front of the travelling Kop, Firmino received a booking from referee Mike Dean. And the former Hoffenheim forward has now picked up more yellow cards for ‘excessive celebration’ than any other player in Europe’s top five leagues since the 2012/13 campaign, with seven. While Firmino is unlikely to cherish his record as fondly as Coutinho, at least it means he’s finding the back of the net too.